On Monday, Sudanese President Omar al-Bashir hopped onto a plane and quietly left South Africa to return to Sudan’s capital, Khartoum, defying a court order from Pretoria that is now calling for his arrest. The long-standing Sudanese president was in Johannesburg to attend an African Union leadersâ€™ summit. He isÂ wanted for war crimes and crimes against humanity by the International Criminal Court (ICC)Â for his alleged involvement in the Darfur war, which began in 2003. According to the United Nations, up to 300,000 people have died in the war, and some 2.5-million have fled from their homes to seek safety. The Pretoria High Court court ordered Bashir to stay in town over the weekend, but the South African government, which happens to be a signatory of the ICC, allowed Bashir to leave the country unscathed. 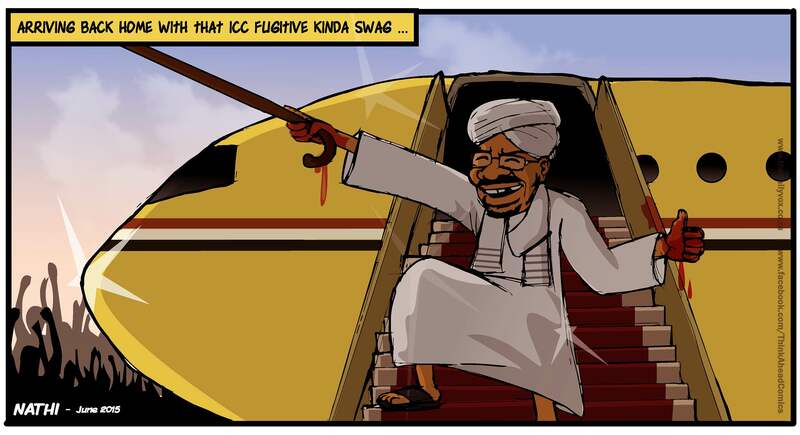 Upon his arrival in Khartoum, Bashir smiled widely, and raisedÂ his caneÂ to welcoming supporters, as heÂ stoodÂ in an open-topped car, surrounded by crowds. Not bad for a man who has blood on his hands.